Yamaguchi spoke publicly about his experiences and appealed for the abolition of nuclear weapons. He appealed for the abolition of nuclear weapons at the United Nations. Tokyo, Japan (CNN) -- The only man recognized as a survivor of both atom bombs dropped in Japan at the end of World War II has died. Tsutomu Yamaguchi died Monday after a battle with stomach cancer. He was 93. 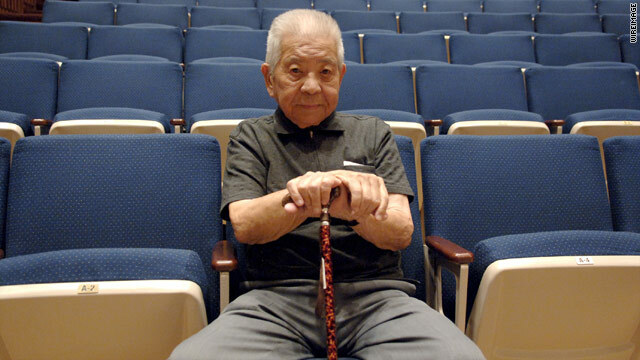 He had long been a certified "hibakusha," or radiation survivor, of the August 9, 1945, atomic bombing in Nagasaki. In March 2009, the Japanese government confirmed that he had also survived Hiroshima three days earlier. On that day, the U.S. B-29 bomber Enola Gay dropped an atomic bomb nicknamed "Little Boy," which exploded over Hiroshima at 8:15 in the morning. Yamaguchi happened to be in the city on a business trip for his employer, Mitsubishi Shipyard. Many years later, he recalled the bombing in a story that appeared in the British newspaper The Times. "It was very clear, a really fine day, nothing unusual about it at all. I was in good spirits," he said. "As I was walking along, I heard the sound of a plane, just one. I looked up into they sky and saw the B-29, and it dropped two parachutes. I was looking up into the sky at them, and suddenly ... it was like a flash of magnesium, a great flash in the sky, and I was blown over." Badly burned, Yamaguchi returned home to Nagasaki only to experience horror again. "My double radiation exposure is now an official government record," Yamaguchi told reporters last year after his official recognition. "It can tell the younger generation the horrifying history of the atomic bombings even after I die." About 140,000 people perished in Hiroshima and an additional 70,000 in Nagasaki. Many of those who survived suffered a lifetime of radiation-related health problems, including cancers. Yamaguchi lost his hearing in his left ear in the blasts, and suffered from acute leukemia, cataracts and other bomb-related illnesses in subsequent years. Yamaguchi spoke publicly about his experiences and appealed for the abolition of nuclear weapons at venues such as the United Nations. He was visited in his hospital room in Nagasaki last month by filmmaker James Cameron, who wanted to discuss ideas for a film about nuclear weapons, the Japanese newspaper Mainichi reported.